It has been awhile since we added a post and a lot has been happening. We are excited to share with you our WSAW News Channel 7 project tutorial. Look for us monthly on the first Wednesday of the month on News Channel 7 at 5:00 pm. 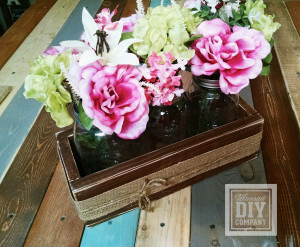 This month we are demonstrating how to make a pallet board planter box. Sander, preferably an orbital or palm sander with 40-80 grit sand paper. Depending on the quality of your boards you may be able to hand sand with sand paper. 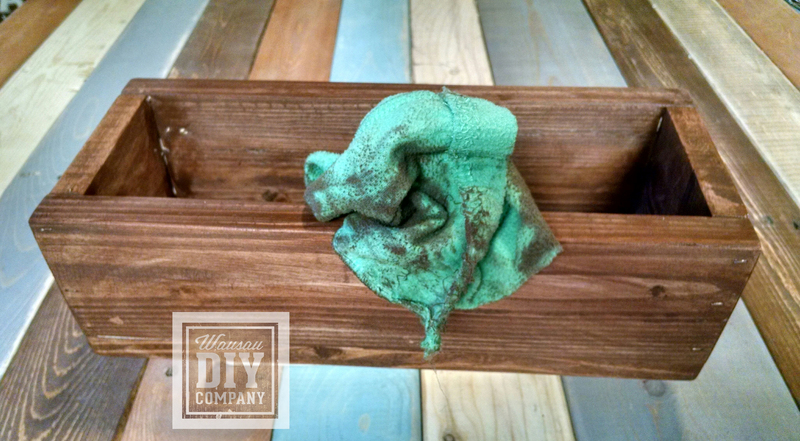 Re-purposed pallet boards typically require more sanding than purchased lumber. 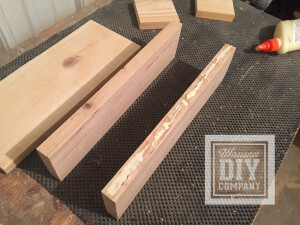 You will need 5 boards for this project cut to the length. 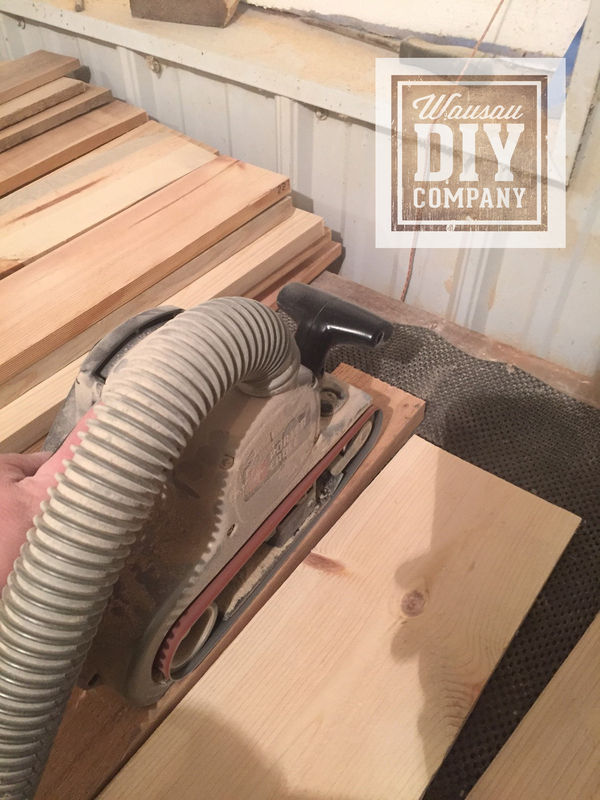 Once you have your boards cut to length, you will need to sand them. 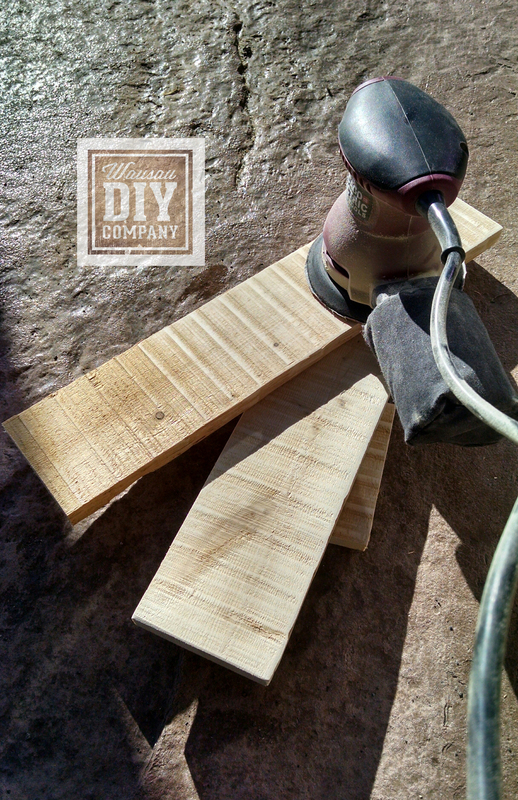 If you are using purchased lumber, you can sand by hand with sandpaper. If you are using re-purposed pallet boards you will want to sand using a palm or orbital sander. 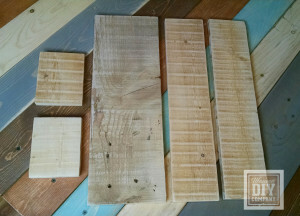 Some re-purposed boards that are very rough may need the more aggressive sanding. If that is the case with your boards, you may need to use a belt sander! We use the belt sander for all of our boards used for sign making. Once you have your boards sanded, you can piece together your box. Due to varying thickness of the pallet boards, you may need to adjust the length of your shorter pieces. Our measurements are based on a standard board thickness of 3/4″. Add a bead of glue to each piece prior to stapling your pieces together. Now you are ready to staple your box together! If you have an air compresser, a brad nailer/air stapler can be purchased for a very reasonable price. They are very handy for DIY projects! We are using 1 1/2″ narrow crown staples for this project. 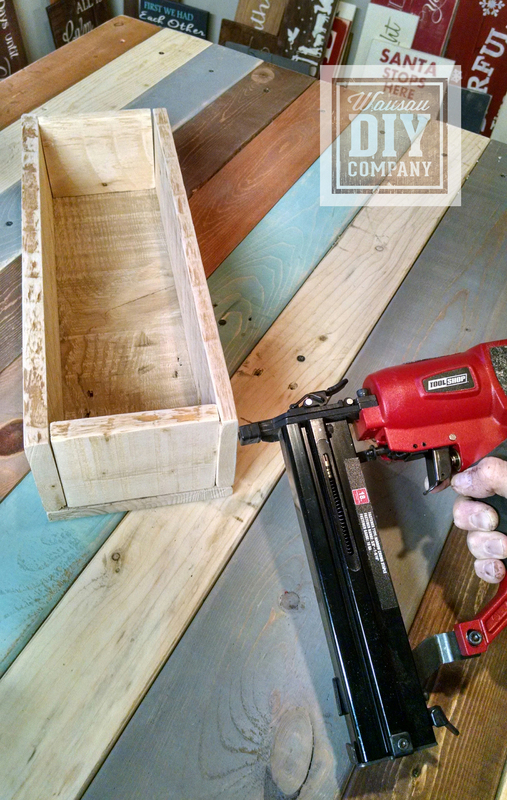 If you do not have a brad nailer/staple gun, you can use nails, or 1 1/2″ wood screws. 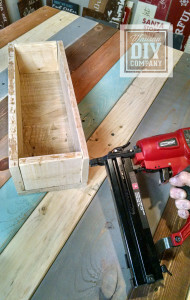 If you are using wood screws, pre-drill pilot holes. The pilot hole will help minimize the splitting of your boards. Once you have your box assembled, sand it a bit more. 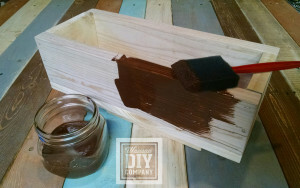 You can sand your edges and corners to ensure it is smooth. 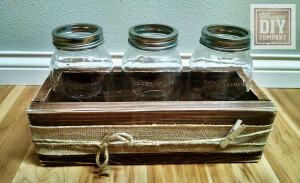 Wipe off any dust you have created sanding and you are ready to stain! We use a water-based stain but any stain will work. We brush on and wipe off our stain. If you want to distress your box, you can sand it again to create the perfect look. Once your stain dries, you can add any ribbon or other embellishments to personalize your creation with hot glue. 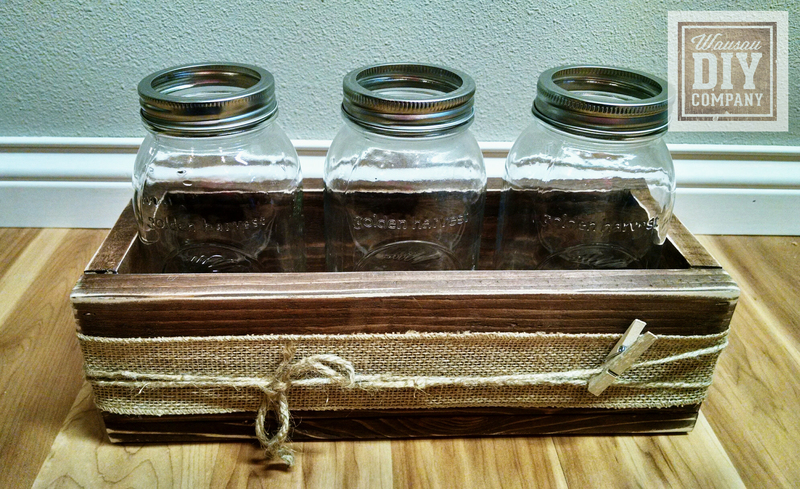 Here is your finished box with quart size canning jars! 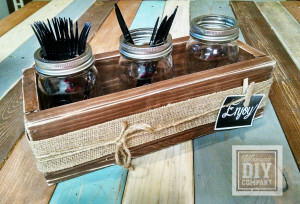 This can be decorated so many different ways, flowers in spring, cutlery holder for summer picnics, Easter grass or eggs for an Easter display, etc. The options are endless!